The MiG-17 (NATO codename “Fresco”) was designed as the successor to the MiG-15 by a team of constructors under the leadership of Artem Ivanonich Mikoyan. The first production batch rolled off the assembly lines in August 1951. Early in 1952, MiG-17s fitted with VK-1A turbojet engines (as used in the MiG-15 bis) began to reach frontline units. The improved MiG-17F, which entered operational service in 1953, was equipped with the VK-1F engine (with afterburner) – ‘F’ standing for forsirovannyj, meaning “afterburner-boosted”. It was the most commonly used sub-variant. The new engine provided an afterburning thrust of 3,312 kN, which gave the aircraft a notably better climb rate and top ceiling. The new variant also featured reshaped air brakes and upgraded avionics. Later production batches introduced the SRD-1M radar gunsight and a new stabilized ejection seat. The MiG-17 was a single-seat, single-engine, all-metal fighter aircraft. The onboard systems enabled it to operate around the clock, in all weather conditions. It was armed with a single 37 mm N-37D cannon and a pair of 23 mm NR-23 cannons. The aircraft was equipped with a retractable, hydraulically-operated, tricycle landing gear. The cockpit was pressurized. The MiG-17’s pilots wore PPK-1 partial pressure suits, which allowed them to sustain higher G loads. Radio-electronic equipment included the UHF R-800 (or R-801) radio sets, IFF SRO-1 (or SRO-2) systems, Sirena-2 RWR, RW-2 radio altimeter and ARK-5 radio compass. 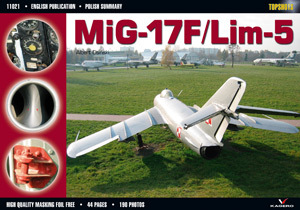 The first MiG-17s saw service with the Polish Air force in 1955. 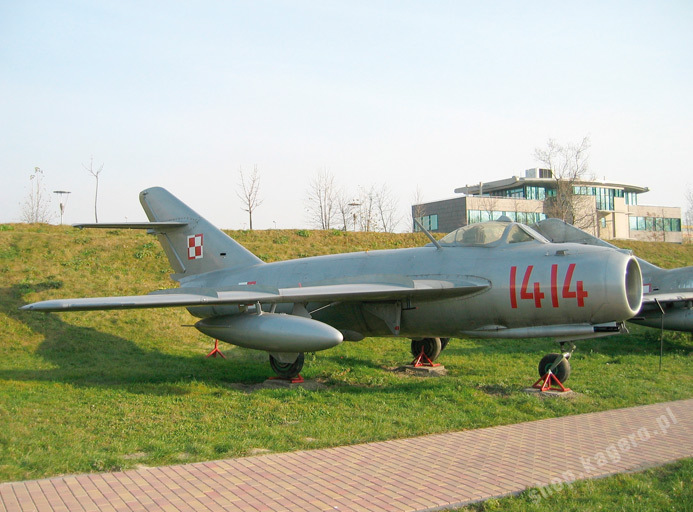 At the same time a decision was made to produce MiG-17s under licence in Polish military aviation plants, which had already worked on MiG-15s (notably, the WSK Mielec plant). The aircraft built in Poland under the designation “Lim-5” (Licencyjny Mysliwiec – licence-built fighter aircraft) were basically the MiG-17F. The VK-1F engine, manufactured at the WSK Rzeszow plant, was designated “Lis-5”. The assault-reconaissance Lim-5R was fitted, in addition, with a photographic camera. The first Polish MiG-17s left the factories on 28th November 1956. The MiG-17 proved very popular and saw service with many air forces around the world. Among the foreign operators were countries of the former Warsaw Pact, Indonesia, Egypt, Nigeria, Somalia and China. MiG-17s received their ‘baptism of fire’ while in service with the Egyptian Air Force in October 1956, over the Suez Canal. They were flown in combat in China (1958) and Yemen (1963) and during the Israeli-Egyptian war (1967) and Israeli-Arab war (1973). The MiG-17’s biggest claim to fame came during the Vietnam War (1965-1973), when it was flown against American F-4 Phantom IIs, amongst other aircraft.